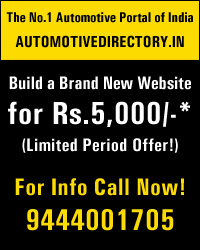 Automotivedirectory.in has started by a team of qualified professional having rich experience in the field of automotive technology, processing and marketing .The sole of aim of this portal is help the automotive people to know about the complete information of automotive engineering and technology, new products, Institutes, associations and Industry trends, and to act as a catalyst to boost the business of all users more effectively and efficiently with the help of Internet communication technology. As we know internet is most effective communication tool of this 21St century to reach the global markets at a most competitive price. Internet has indeed made the world even smaller and brought people closer. With its communication advantages, the Internet revolution has touched practically every aspect of our private and professional lives. We promote automotivedirectory.in by the most powerful search engine marketing techniques, which will provide excellent enquiry to all our members for their relevant products / services both domestic and International Buyers. In short automotivedirectory.in is an online automotive Industry trade booster and information provider for all manufactures, agents, traders, especially, small & medium sized manufacturers, exporters, importers all over the world.